After a couple weeks that brought some very discouraging news, as well as a lot of “pseudo-news” that had nuclear supporters in full-on FUD-busting* mode, this was a refreshing article to find in my Inbox on Thursday. How do we ensure that? Through our culture. Our nuclear safety culture is the only thing that can breed the trust that we deserve to be a viable energy solution for the future. via Fighting for the Next Inch | ANS Nuclear Cafe. With that, I am going to make an assertion that may seem rather bold, but it needs to be said: Nobody — no person or group of people — cares more about the safety of nuclear power generation than the scientists and engineers and plant operators that make it all work. Nobody. Not the politicians, not the pundits, not the media, not even the inspectors and regulators, and certainly not the anti-nuclear activists, much as they may claim the contrary. Not even me. This is why I choose to get my news not from the “mainstream” media, or the activists (even though I myself could be called an activist), but from the educated professionals, the scientists and engineers. I, too, am an engineer, though in a different field, and when I see my fellow engineers disparaged as being untrustworthy because they are “industry insiders,” or worse, “paid shills,” it makes my blood boil. Those are my fellows, and if you attack them, you attack me. I’ll say it again, with complete confidence: These “industry insiders” care far more — and understand far more — about the safety and integrity of their industry, and its benefit to our environment and humanity, than any anti-nuclear activist or purveyor of fear and doubt ever could or will. And I will not again hesitate to say so. Small modular reactors: an excellent example of nuclear progress. Future May Be Bright For Modular Nuclear Reactors – Forbes. I also appreciate Mr. Lynch’s opening phrase: “The planned shutdown of the Vermont Yankee in the face of cheap, natural-gas fueled power….” Pleased to see that he gives not a speck of undeserved credit to the “Hired Gundersons” who seem to think that the shuttering of Vermont Yankee is all because of their efforts. Liberals and the left are frequently critical of Republicans and the right for the manifest hostility to science, including of course their stubborn refusal to recognize the reality of human-caused global warming (not to mention, say, their denial of evolution). In the case of nuclear power, however, the left and many environmentalists have too often allowed themselves to be caught up in an almost superstitious fear of nuclear energy. Vast problems accrue to nuclear energy, of course, as with all technologies. But they can be solved. via The IPCC Report and Nuclear Energy | The Nation. Exactly what I’ve said elsewhere. It’s too often our own brand of “anti-science” (although I don’t particularly like that term). The fear does indeed border on the superstitious. Another thing that I find disturbing is the eerie sense of “told-ya-so” glee that sometimes accompanies the sharing of news (or “news”) of the latest bad report — the groundwater situation at Fukushima, for example. But that’s the subject of another diary, which I hope to write this weekend. It’s no secret that I am a fan of the Integral Fast Reactor and what I hope will soon be its commercially produced and deployed version, the PRISM (Power Reactor, Innovative Small Module). This is one of many next-generation nuclear technologies that I hope to see developed and implemented in the near future. Now there is an opportunity to give it a boost, as Tom Blees has made a pitch to the Climate CoLab at MIT. I encourage my readers to go and vote for Tom’s proposal to make a presentation on the IFR/PRISM at an MIT conference in November 2013. Doing so would give this technology a lot more traction in the US. Please, take five minutes to register and vote for Tom. There is also a very good and comprehensive description of IFR technology at the same link, worth taking the time to read through. via Integral Fast Reactors Can Power The Planet Proposal – Climate CoLab. I am partway through reading Tom’s book, Prescription for the Planet. He presents an ambitious and fascinating vision, and the book is a fun and interesting read. Check it out here. Looks like I have more reading to do! Meredith Angwin, of Yes Vermont Yankee, has just called my attention to (my) fellow progressive and pro-nuclear blogger Charles Barton. I have not had a chance to peruse his site in any depth, but I will definitely do so, and I am adding him to the blogroll here. Join me in checking out The Nuclear Green Revolution. While historically conservatives have been the prominent supporters of nuclear energy, the urgency of climate change has recently compelled liberals and progressives to reconsider nuclear as the best zero-carbon source of baseload electricity for a world with rapidly rising energy demand. via The Breakthrough Institute – Liberals and Progressives for Nuclear. That would be me, in a way, although I would never have made Barry Brook’s list. (I’m not “well-known.” In fact, I’m pretty much entirely unknown.) I found Brook’s Brave New Climate blog (see blogroll to the right) just after Fukushima, and decided it was time to really educate myself, rather than making the typical knee-jerk reaction that I see too often on the left. Recently, with the gentle encouragement of Meredith Angwin of “Yes Vermont Yankee”, I’ve started this very modest pro-nuclear blog. Let me be very clear: I am not a nuclear professional, nor do I have any education in that field. I have simply been reading every article I come across (as well as a few books), and if I have anything substantial to say about it, I may put up a post. At best, I could consider myself a kind of “cheerleader” for nuclear progress. I have come to realize that we (liberals and progressives) cannot afford to continue sticking our heads in the sand when it comes to the one kind of power generation that is capable of providing ample energy at nearly zero carbon cost. And we cannot go on ignoring the real science behind nuclear power, especially while accusing others of being “anti-science” about issues such as climate change. via Radiation monitor problem not “failure’ Entergy says : Times Argus Online. This is good news, to be sure. However, I think that this statement begs to be ridiculed, and that Williams could have stated the truth much better. The fact is that the sensors produced signals that were not accurate; it’s just that this malfunction (or, indeed, failure) caused the system to assume a safe-state, rather than leading to a wider system failure, or perhaps worse, a sense of false security. In this case, the “false sense” was one of alarm — sensors showed a high level of radiation that was not, in fact, found to be present. Far better this outcome than had these sensors not indicated high radiation levels that were present, due to their inability to detect it. But they still, frankly, failed to perform their primary function. This incident could have been used as an excellent “teachable moment” regarding the real meaning of the term “fail-safe.” This term is widely misunderstood to mean “safe against failure,” and often used mistakenly in place of “fool-proof.” It means nothing of the sort. “Fail-safe” describes a careful and deliberate design characteristic in which the failure of a component or portion of a system will cause the system to make a transition into a safe state. In other words, “fail-safe” design is the application of the old proverb, “better safe than sorry,” to the practice of systems design. All systems can fail. In fact, failure mode effects analysis (FMEA) is one of the most important, as well as fascinating, aspects of engineering. Entire departments are dedicated to analyzing and predicting what would happen to the system in the event that any given part, or multiple parts, were to fail in some particular way. The idea, of course, is to design those parts and the overall system such that the failure of one or more parts will result in the system falling into a condition that will not cause further damage, or lead to injury (or worse) to its operators, the public, surrounding equipment and structures, the environment, etc. So yes, I would argue that the monitors did in fact fail. But they “failed safe.” Which is exactly what they, and the system of which they are a critical part, were designed to do. Hargraves finds it straightforward to be in favor of continued operation of currently operating LWR like the Vermont Yankee nuclear plant AND in favor of rapid development of LFTRs. I feel the same. 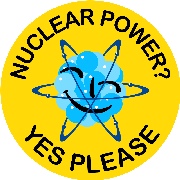 via Prisoner’s Dilemma and New Types of Nuclear Reactors | ANS Nuclear Cafe. As do I. Honestly, I have been puzzled by the fighting I have seen between proponents of various reactor technologies since not long after I began my investigation of the overall subject a few years ago. Some even seem downright cultish in their single-minded advocacy of their respective favorites, whether it be thorium reactors, integral fast reactors, or something else. Why? Angwin uses the concept of the “Prisoner’s Dilemma” to illustrate this quite unnecessary conflict, pointing out that when the “prisoners” are able to communicate with each other, they are more likely to mutually make the choice (neither attacking the other) that leads to the greatest benefit for everyone. “Let’s start communicating,” is the takeaway line. Mark Lynas’ “Nuclear 2.0:” The case for a Grand Alliance of Low Carbon | The unpublished notebooks of J. M. Korhonen. The IFR, with its metal-fuel system and pyroprocessing, is able to utilize the actinides to such an extent as to essentially solve the waste problem by reducing the radiological toxicity of the waste products from hundreds of thousands of years to a mere few hundred years. I’m still reading Plentiful Energy, but the book is fairly dense and not what one would call an “easy read,” although the information it contains and history it describes is nothing short of rich. (Tom Blees’ Prescription for the Planet is written in a more personal and conversational style, and is faster and much more “fun” to read.) “Pocket essays” such as this white paper are very helpful in gaining a quick understanding of this technology, which can be fleshed out through investigation of the cited sources and books referenced. It is also something that can be easily shared with friends and associates, without asking them to commit to an entire book.